This dressing is swoon-worthy. Amazing on a crunchy salad, great as a dip for spring rolls, fabulous as a marinade. 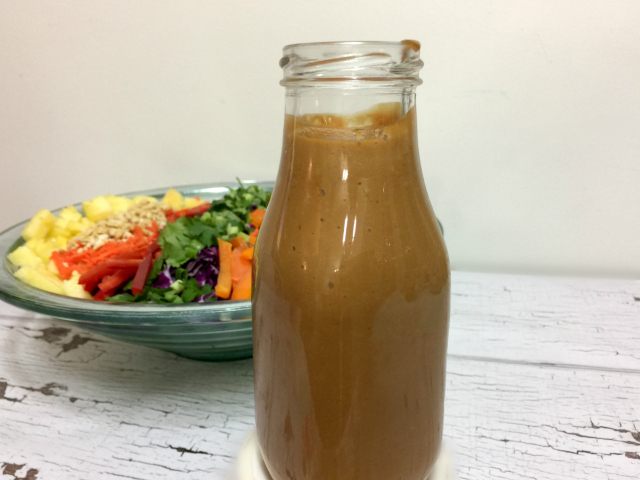 Easy Thai Peanut Dressing comes together in just a few minutes in the blender with simple ingredients. I made this over Easter to take to a large gathering. 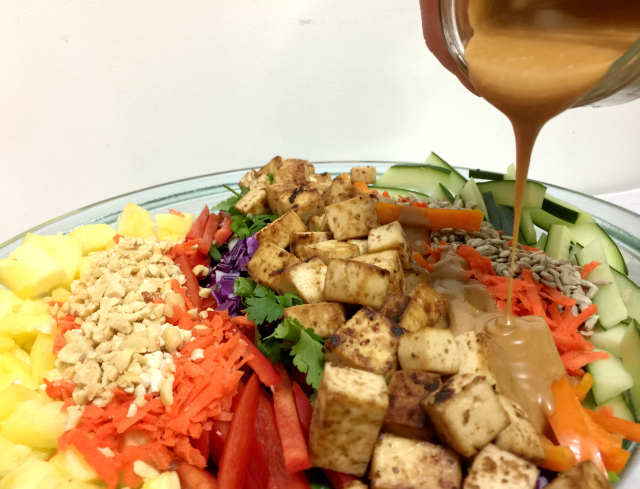 It made the perfect dressing for my Crunchy Thai Salad with Baked Peanut Tofu. I have to admit I was hoping for leftovers but instead found my giant salad bowl had only a smattering of cabbage and one lonely cube of tofu left in it. I blame this on the dressing. Garlic: use fresh cloves. I grate using this microplane. Peanut Butter: I’ve been using the Simply Nature from ALDI lately. It’s nice, creamy and affordable. Maple Syrup or Honey: I have made this with both and prefer maple syrup. Honey is a bit more sweet in this dressing, so if you enjoy a hint more sweet, go with honey. Gluten-Free Soy Sauce: Usually that is Tamari in my kitchen, but Bragg’s Aminos or coconut aminos works as well. Lime Juice: Fresh-squeezed makes a big flavor difference. Rice Wine Vinegar: you can use any vinegar, but this is the best flavor for this dressing. Toasted Sesame Oil: I buy this at Trader Joe’s for the lowest price I can find in my area. Sriracha or Gochujang: Add a nice bit of heat. If you are using Gochujang, make certain it is gluten-free. I like Wholly’s best. 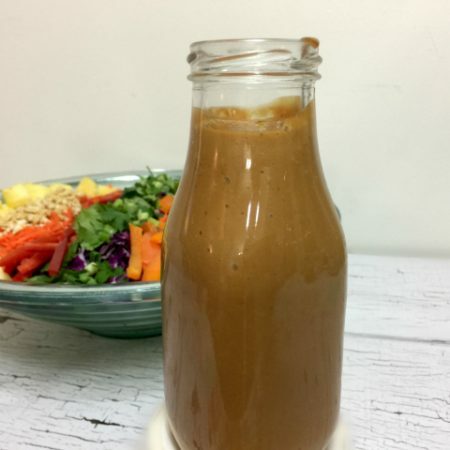 I blend this dressing in my VitaMix blender*, however you could use a food processor instead of a blender if that is what you have handy. While it is a pretty thick dressing, it isn’t one of those concoctions that requires a high-speed fancy blender, any blender will do. I used a super cheap blender for many years and it worked great for most things. (Or mostly margariatas. I should be honest in my former cheap blender habits.) Use what you have is my point! *I am a fan of refurbished appliances. I’ve had a refurbished VitaMix for years and it hasn’t let me down. The savings were substantial. Add all ingredients to blender or food processor fitted with "S" blade. I’m so glad you enjoyed it! It’s definitely a favorite dressing here. Will give it a go with almond butter soon. I also think it would be good with cashew butter! I also think so too! : ) Cashew butter would make it ultra rich and creamy! This was so easy, super tasty, flavorful and definitely swoon worthy. I made with coconut aminos, sriracha and honey. This is a keeper!! Thanks for a great recipe! Fantastic! Thanks for sharing what worked well for you. I spotted coconut aminos at Trader Joe’s recently and will definitely pick some up.